The MQO poll reported today, projected across the province using uniform swing models, would result in a very narrow, hobbled, and unstable PC minority government of 18 or 19 seats. Incumbent Premier Kathy Dunderdale's would not be among them: on the numbers reported today the NDP would dominate metrotown, including a sweep of the city of St. John's itself. The NDP would surge to second place, with 17 seats, while a Liberal caucus of a dozen or more would hold the balance of power. Both opposition parties would gain their new seats by cannibalizing the festering carcass of the Tory electoral map from 2011. Very helpfully for them, neither of the two opposition parties would pick up seats from the other. 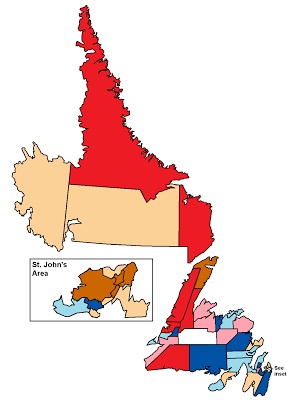 This map shows the notional province-wide projection, using traditional party colours. For the Liberals and NDP, dark shades indicate "holds", while paler shades indicate pickups from the governing PCs. For the Tories, pale blue indicates notional wins by a margin of less than 10% over the closest opposition challenger. The Minister of Service NL says people should not jump to conclusions about the new online restaurant inspection guide. Nick McGrath says it isn't a bad thing for a restaurant's health inspections to be posted online, nor is the point to air dirty laundry in public. He says the point is about being open, and giving people the opportunity to know what goes on during an inspection. He says he thinks that's been achieved. McGrath says the important thing is for people to go online and understand how inspections work before passing judgement. He says you can't just click on a restaurant looking for the bad things. He says you need to read the beginning, find out what the codes mean, and understand the difference between "critical" and "non-critical." A remarkable change in attitude from Minister McGrath's hapless predecessors in office, and current caucus and cabinet colleagues, Paul Davis and Fairity O'Brien. It can't be many months now before the government finally convinces themselves that they thought of the idea all on their own. In the same week that a lot of people in Newfoundland got upset about the ignorance of someone who confused the Port au Port Peninsula, with Port-au-Prince, the capital of the "Dominican Republic", there have been, among many other comments on the George River caribou controversy which are objectionable for other reasons, numerous comments like these. There are numerous differences between the cod fishery and the caribou hunt. The major one is that the cod fishery was a commercial enterprise. The caribou hunt is not. The Innu have also not been financially or economically dependant on the hunt for close to fifty years. Today it is more similar to the Newfoundlander looking for his moose. 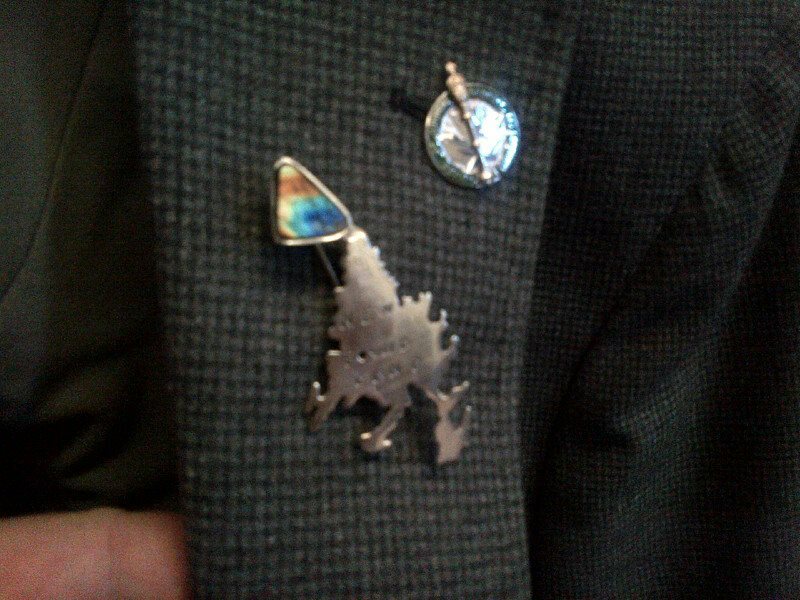 While there are important ceremonial and traditional issues around the hunt, it cannot be compared to the cod fishery which accounted directly or indirectly for a significant portion of the province's gross domestic product before the moratorium.The Inuit looked into a commercial hunt back in the 80s, but for a number of reasons it was not feasible.While I agree that government has responsibility for the herd, the Innu are not the only hunters. There are Inuit, Innuktuavit, white settlers on th coast, the Lake Melville region, and in Labrador west. These people could argue very strongly that their rights to hunt caribou are just as important as the Innu rights. There's a lot more I can say on this topic, but I'll leave it for now. By the way, I'm not a native basher or a racist. Randy, I've lived in Inuit Communities. It's time someone said what so many either do not realize, or are afraid to say! Our Governments pour millions of taxpayer dollars into these communities, and it is spent with no accountability. It's about time someone got mad and said exactly what's on their mind. Keep up the good work! Stop, or we'll say "stop!" again! Adding Labrador, but only as an afterthought, and at a fraction of its size relative to Newfoundland? Why, you'd almost think Ryan was a Newfoundland nationalist-separatist or something. In order for financial statement information to be useful to users, it should possess four principle characteristics - understandability, relevance, reliability and comparability. One of the ways relevance is achieved is by ensuring the information is received by users and decision makers in a timely manner. The usefulness of information for decision making declines as time elapses. The Public Accounts for the fiscal year ended March 31, 2012 were released on January 16, 2013, approximately 9½ months after the end of the year. The relevance of this information is considerably diminished and would be more useful if it was released earlier. This is directed at the same government that takes nearly a year to issue electoral finance reports, spends months and years obfuscating reasonable requests for public information, and releases government-commissioned reports "within 30 days", where "30 days" means "a year". So, good luck with that subtle advice, Mr. A-G.
MR. BALL: Mr. Speaker, after last year's election the Premier appointed Mr. Ross Reid as the deputy minister of the Voluntary and Non-Profit Secretariat which is now a division of the Office of Public Engagement. This week, the Premier appointed Marilyn Field as deputy minister to the Office of Public Engagement. I ask the Premier: Do we now have two deputy ministers in the Office of Public Engagement? Or is Mr. Reid gone and if so, where? MR. HUTCHINGS: Mr. Speaker, last fall the Premier gave direction and set up the Office of Public Engagement. It has brought together five entities: the ATIPP office, Office of Youth Engagement, the Rural Secretariat, Strategic Business Partnership, and the Non-Profit Sector. That was basically to recognize the good work that has been done, but to build on that and bring those entities together to make sure on both ends that the information that we can release to the public is there and easily more accessible. We have made some efforts in terms of that already; they will continue. As well, in terms of the dialogue and consultation in terms of social and economic policy, that continues again in the good work that we do. Just recently there was a deputy minister assigned to head up the Office of Public Engagement, a well-qualified individual. We are looking forward to working with her, as a new department together, and the good things that we have done in the past and build on that with Newfoundlanders and Labradorians, Mr. Speaker. Note the added emphasis in the question. Note also the Minister's lack of a specific response to that surgically-precise factual question. As it turns out, Mr. Reid was appointed to Yet Another Deputyministerial Job on December 17th. This fact was revealed to the public by The Most Open And Accountable Government In The World on, um, January 17th. No more giveaways? No! More giveaways! Our goal has been to ensure that Newfoundlanders and Labradorians are the main benefactors with respect to our natural resources, and that the development of Hebron maximizes benefits for the people of the province. Memo to the Premier, and to clueless MHAs and highly-paid comms professionals throughout provgov: the benefactor is the one who gives stuff away. The word you are looking for is beneficiary.